As a talented and explorative photojournalist, Donna Ferrato, for years had pursued domestic violence, a subject that people didn?t want to confront yet profoundly impacted the lives of many families. Her pictures depicted violence against women, and appeared in a number of major magazines such as Life, Time and People. In the American Photographer issue on photojournalism (1991), Vicki Goldberg describes Ferrato as a photographer ?who has emerged from- and goes beyond- the black and white documentary tradition.? Ferrato, born in 1949, was raised in Lorain, Ohio and graduated from Laurel School in Cleveland. She started working as a freelance journalist in 1976 and had travelled extensively. Ferrato contributed Women at War in the Persian Gulf for Life Magazine, the Horror of a Red Cross nurse in Somalia for the People Magazine. And ?Battered Women Who Kill? was a cover story for the Time. 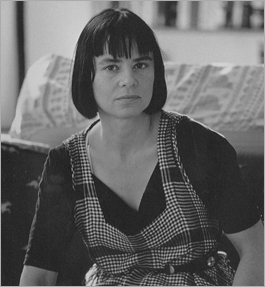 Her work on domestic violence earned her many awards, including the W. Eugene Smith Fund Grant for Humanistic Photography in 1985, first place in both the ?Magazine Picture Story of the Year? and the ?Documentary Picture of the Year? categories in the 1988 Pictures of the Year Competition (University of Missouri). Ferrato?s enthusiasm to delve into the topic also pushed her to grow as an expert on this issue. She lectured about domestic violence in many different places. She even had a private meeting with Hilary Clinton in the White House to discuss this issue. In 1991, Ferrato published a book “Living with the Enemy,” which chronicled domestic violence and the impact on families. The publication of her book draw more attention to her work, encouraging her to start a non-profit foundation called the Domestic Abuse Awareness Project (DAAP), to supply exhibitions to battered women?s shelters around the country for fund-raising. 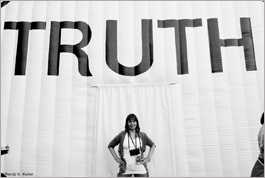 The DAAP had been educating the public about the societal causes of violence against women through her photographs. In recent years, Ferrato published a historic book Tribeca, in which she used photographs to explore the 10 years of living there after 9-11 attack and the healing and rebirth of the neighborhood. 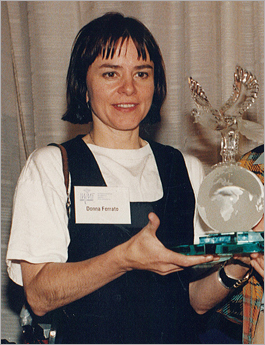 Donna Ferrato is the second Courage in Journalism Award winner from the United States, following Caryle Murphy(1990). U.S. awardees after Ferrato are Christiane Amanpour (1994), Corinne Dufka (1997), Elizabeth Neuffer (1998), Anne Garrels (2003) and Jill Carroll (2006).